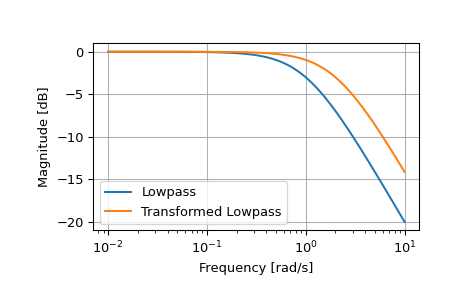 Transform a lowpass filter prototype to a different frequency. Return an analog low-pass filter with cutoff frequency wo from an analog low-pass filter prototype with unity cutoff frequency, in transfer function (‘ba’) representation. Desired cutoff, as angular frequency (e.g. rad/s). Defaults to no change. Numerator polynomial coefficients of the transformed low-pass filter. Denominator polynomial coefficients of the transformed low-pass filter.